Dr. Britton Hart, principal at Emporia High School, has been selected as the 2016 Secondary Principal of the Year by the Kansas Association of Secondary School Principals. Dr. Hart also is the state’s nominee for the National Secondary Principal of the Year. Dr. Hart has been principal at EHS since 2014, after serving seven years as an assistant principal and athletic director at the high school. 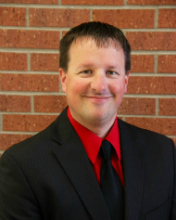 He is Emporia’s second Principal of the Year in recent years. EHS Principal Scott Sheldon received the award in 2013. Also, in 2011, former EHS Assistant Principal Amy McAnarney received the Secondary Assistant Principal of the Year Award. “Some of the things we’re trying to do as a school is to help students and create a culture of learning where all kids can thrive,” Hart said regarding what he was told went into his selection. “Things like the trimester and things like our intervention process or using an electronic walk-through tool. There’s a lot of good things going on.